Over 20,000 people have trusted us to create and send their invoices since 2008! When you are engaged in the development of your business, you should think about accounting in advance. Such an attitude towards activities will allow you to closely monitor the progress of the enterprise and catch the moment when emergency intervention is required. The process of turning a business from profitable to unprofitable often goes unnoticed. For small businesses, accounting helps gain an understanding and overview of what is happening over time. The acquisition of basic knowledge and skills contributes to the quality of work, and, accordingly, to profits. Proper accounting is important for successful business planning. The entrepreneur must have a clear idea of his actual income and expenses. His responsibilities include making mandatory tax payments, the frequency of which is fixed. For this reason, constant monitoring of activities is necessary to prevent the imposition of fines. You can pick up both a real and a virtual assistant, which will positively affect activities. It is therefore enough to master the program and have a basic knowledge of the fundamental rules of accounting. Full delegation of all tasks to a specialist is not always justified from a financial point of view, and, if desired, it is quite realistic to cope with some of the tasks on your own. All data in online invoicing is stored on servers and can be accessed from any computer, phone or tablet with internet access. At the same time, after the usual authorization procedure, it is possible not only to review, but also to edit or create new documents and reports. An entrepreneur has the opportunity to work from any location without the need to carry a large amount of documentation. The existing standards are often amended, or the form of any blank can be completely updated. Virtual invoicing removes the obligation to track these innovations. The entrepreneur can always use only relevant forms that meet current standards. 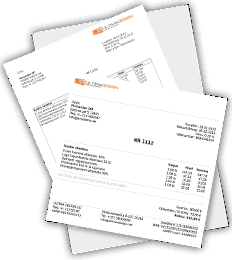 Online invoicing works at server capacities without using up the disk space of the computer, laptop or other devices. No need to download extraneous programs or applications. All information is stored in the so-called „cloud“, which ensures its safety. In the event of a computer failure, you can access the data from another device. When all documentation is kept in the same old way, on the PC without a backup, the entrepreneur risks losing it without the slightest possibility of recovery. Fears about theft of information from servers are unreasonably exaggerated. Such a risk, of course, exists, but our encryption technologies and choosing reliable hosting solutions (Webzilla Inc.) allow you to securely protect your data. We have not had a single case of a server being hacked in over 10 years of work. Installing licensed invoicing software is rather expensive. Our online service is easier to maintain, as it does not require additional technical support and has attractive prices for use by entrepreneurs. Our service allows the entrepreneur to invoice without any problems, even without special training. An intuitive interface and plenty of prompts help one master the basic principles in just a short time. In a few hours, it is possible to cope with all the features and start using the service to the maximum. There are not many disadvantages to virtual invoicing. These include the presence of the permanent access to the Internet, but without this, accessing and working with documents are impossible. Our program is the market leader in online invoicing services, allowing you to carry out both local and international activities. Try it completely free; the setup takes only a few minutes. I tried different invoicing solutions but like Inv24 the most ! Fast, reliable, secure. Friendly support. I recommend it. I like user-friendly environment and simplicity. 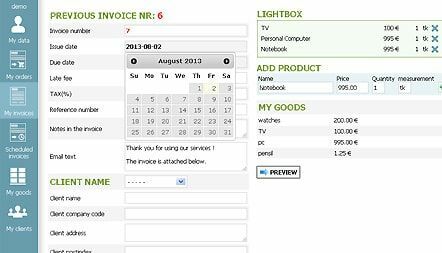 Invoice tracker is also nice.